Hopefully this Lewisham Homes 'Get Gardening' application process is less half-assed than it appears to be. Having read through the application form, I have my doubts that a gardener had anything to do with planning it. There is no mention of planting fruit trees for a start. Funding for community vegetable growing projects which comes through IN MAY. Sowing wild flower seeds IN MAY How very useful! You can of course still direct sow runner beans and courgette, or spend half your funding buying in older plants from the garden centre. But where is the fun or the learning in that? So yeah, a clear ethos of Grow Your Own and sustainability at the heart of this Lewisham Homes scheme. If you're aware of a Lewisham Homes site which could do with gussying up- then there is up to £5,000 available for community improvment projects. Who can apply? You can be a Lewisham Homes resident, a group of residents, or a community group or social enterprise, but your project MUST be for, and benefit, Lewisham Homes residents. Your project can be a one-off piece of work, or last for weeks or even a couple of months. Successful applicants will be notified in early May. How to apply If you have a fantastic idea for a community project then book your place now for a one-to-one support or training session on how to apply for funding. Email [email protected].uk or call Joy Burnett on 020 8613 7662. Join Nature's Gym! The New Activity Calender is out. Nature's Gym is a fabulous team of Lewisham residents who volunteer their time at Green projects and nature reserves around the Borough. It is led by a really fun and enthusiastic Conservation Officer. Well worth checking out. It's a fantastic way to make new friends and gret a good work out too! https://drive.google.com/file/d/0BzDNtVMWPY_SM2xrekFISHZEd2tkakRkTl82NnctcEdIcGJF/edit?usp=sharing" target="_blank" rel="nofollow">The Natures Gym Activitiy Calender January to March 2014. Do you have a passion for flowers and want to meet people with similar interests? Join the award winning flositry Department at the Deptford Campus! They offer two bespoke courses that will help you develop a wide range of creative craft floristry skills and designs. Both courses are 1 evening week over 20 weeks. Lewisham In Bloom competition 2013- Open for applications! Best in Show Winners, 2012: The hanging Gardens of Oscar Street, SE8. Click here for how to enter for 2013! Applications to be submitted by Friday 5th July. Judging will take place in the following 2 weeks (8th July - 19th July). Reusing builders bags for raised veg beds. Bags available FREE in Lewisham . If you'd like to collect from the Wearside depot please contact [email protected] directly to arrange a time / day. Katy is the fantastic Allotments Officer based at the Wearside Rd Depot in Ladywell, just off Lewisham High Street. Lewisham in Bloom 2012- Winners & Full Results! 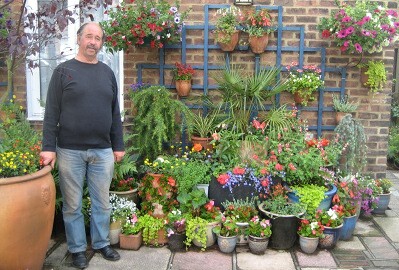 The hanging Gardens of Oscar Street, SE8, Overall Winners Lewisham in Bloom 2012! Pupils are actively involved in their school garden. There are a wealth of learning opportunities - with defined wildlife, flower, bee and butterfly areas. Great enthusiasm from staff AND students. Maire has a mature forest garden and has planted to encourage local wildlife. Maire demonstrated extensive knowledge of native species and habitats. From a start of one house on the street putting out baskets and planters, now the entire street is involved in planting. Every house has planters and hangin baskets. Beautiful planters with extensive mixed planting. Huge local impact. Mr Lee wins again! Mr Lee has a wonderful garden with a deep knowledge of an experienced plantsman. His garden has year round interest and colour. He also tends to the gardens of his infirm neighbours. Wonderful! The sharp suited Mr Argyle won for his fantastic summer display. His baskets and planters were greatly enhanced in this greatest of summers by Olympic flags, bunting and Unions Jacks. WINNER: The Oscar Street Residents! The Frank Mason Cup was presented to the residents by Carl Hughes of Glendale, Lewisham's Council's largest parks and green services contractor. Mr Hughes is himself is marking 40 years of service with Glendale. Jean Jewell, Maguita Stuber, Gail Barnes Gerry Henderson, and Sheila Clarke- ringleader and chief planter! Mr Board: Potty about pots! 2nd place Large Front Garden category. Many thanks to the 2012 Lewisham in Bloom Judges: Colin Melton and Alan Morgan of Beckenham Place Park. Cllr Susan Wise, Mayoral Cabinet member for Customer Services handed out the prizes and Martin Hyde was MC. Thanks also to the always graceful Katy Delaney who organised and facilitated the event. New has been announced of the opening of the third funding round for Community Garden Small Grants in Lewisham. 14 Green Flag Winning Parks for Lewisham! Green Flag Awards are the national standard for quality parks and green spaces. And Lewisham Parks won 14 awards this week! Glendale is Lewisham Council's parks' contractor who must be congratulated, but we must not forget the many 'Friends and Users' Groups who put so much into ensuring we all have great green spaces to enjoy. The Green Flag Community Awards are for green spaces managed by voluntary and community groups.